When I shopped at the Daiso (100-yen shop) in Tokyo, I used to look at the cheap products on sale there and investigate their country of origin. On the packages, it often said very prominently, "PRODUCT OF JAPAN." I took this to mean that this item was manufactured in Japan. It turns out that saying something is a "product of (country)" has nothing to do with where it was made. It just means that the country it was marketed for is the given country. I realized this after careful inspection of these cookies, which I purchased at Daiso Japan in Cupertino for $1.50 (156 yen). As an aside, I should note that I rarely buy snacks there these days because their inventory so rarely changes. These were the first new product that I was drawn to there in quite some time. Getting back to the point, this says "PRODUCT OF JAPAN" just as I've written it here in all capital letters and right under it, it says, "Country of Origin: China". I have to wonder if the all caps is intentional. It's the equivalent of "pay no attention to the man behind the curtain." It's not that I'm particularly troubled that my cookies are from China. I'm very egalitarian about such things, but I do think that it's a wee bit on the naughty side to label things as they are on the package. Packaging aside, and as another aside, a recent study says that packaging matters a great deal to people so is it any wonder that I'm droning on about it, let's talk cookies. I was drawn to these because of the "five grain" aspect. Those grains are corn, black sesame seed, peanuts, oats and black soy beans according to the front of the box, but the first ingredient is actually wheat flour. Note that ingredients are listed in order of volume in the recipe and, listed after salt, are black soybean, peanuts, and oats. That means there are fewer of those ingredients than salt. I'm pretty sure that means somoene tossed a peanut, a thimble of oats, and a black soybean into the vats and that there are trace amounts of them. Well, if these are insanely salty, then I may be wrong. As it turns out, these cookies are not incredibly salty, nor are they super sweet. 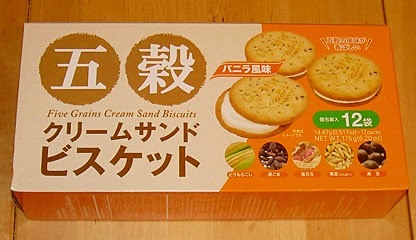 The outer biscuit is earthy and mainly tastes of black sesame with a whole wheat sense in the background. The vanilla filling doesn't come through much at all with the stronger grain flavors and it mainly adds texture. I think you'd have to unsandwich the cookie, eat half and place the filling against your tongue to get a sense of it, but I didn't bother to do that. I'm a purist and will eat it as it is presented. 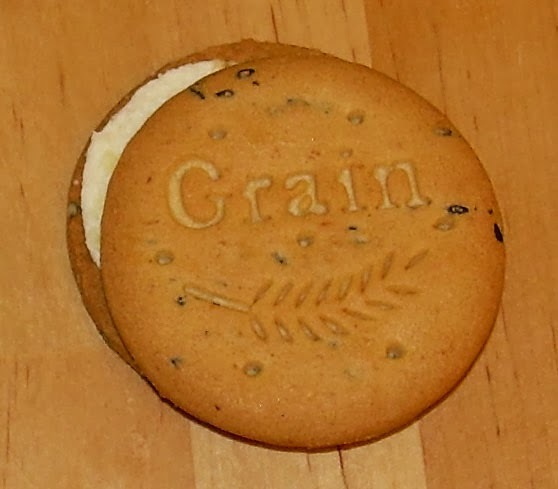 This is an interesting cookie because it has a lot of flavor depth and feels more like a health food biscuit than a sandwich cookie. It still carries Oreo-level calories at 67 calories per (they are bigger than an Oreo though by about 25%). No doubt a lot of those calories come from the second, third, and fourth ingredients: sugar, refined palm oil, and shortening. Those make it clear that, while this may sound like a health food, it's got plenty of bad fats in it to spoil the whole grainy goodness. Still, this isn't a blog which concerns itself seriously with nutrition when it comes to snacks. I'm not complaining and merely noting that the multi-grain nature is not related to these being nutritionally sound. As someone who actually prefers brown bread to white bread and stronger, earthy flavors to the blandness of white flour, I enjoyed these. I'm not sure if I'd buy them again, but I certainly wouldn't rule it out. The fact that the black sesame dominates is an enormous plus for me. If you enjoy whole grains and black sesame, then you may want to give these a try.